Germany – the states of Schleswig-Holstein and Lower Saxony, also with ports at Bremerhaven and Hamburg. France – with a port of entry at Calais. England – a part of the United Kingdom, with a port of entry at Dover. 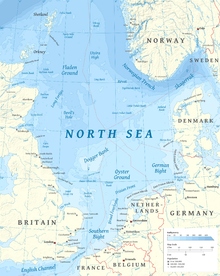 There are sizeable islands and archipelagos around the edges of the North Sea, including the Orkney, Shetland and Frisian Islands. The Norwegian coast is famous for its fjords. Crossing the North Sea is possible with a number of UK east coast ferry routes. This travel guide page was last edited at 07:13, on 1 March 2019 by Wikivoyage user Traveler100. Based on work by Wikivoyage users Traveler100bot, LPfi, Wrh2, Andrewssi2, Texugo, Eco84, Globe-trotter and (WV-en) ImportBot, Wikivoyage anonymous user 84.194.17.138 and others.